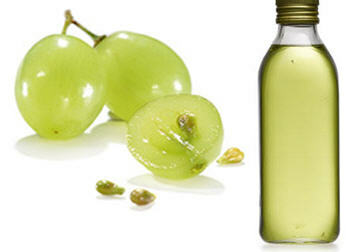 Grapeseed oil is good for skin and hair. It is a natural carrier oil derived from grape seeds. It moisturizes the skin without clogging the pores and making it greasy. Moreover, grapeseed oil tones and tightens your skin, improves skin texture, and promotes elasticity. Plus, it reduces wrinkles and helps fade acne scars. It can also be used as a suncreen. As grapeseed oil is rich in antioxidants, it protects against free radical damage, and helps maintain younger-looking skin. The oil is packed with omega-3 fatty acids, omega-6 fatty acids, vitamin E, etc. It has astringent and anti-inflammatory properties. • Simply applying grapeseed oil makes your skin soft and shiny. It helps reduce acne scars, stretch marks, eczema and psoriasis as well. Plus, it can be used to remove make-up and manage dry, frizzy hair. Besides, you may add a few drops of this light and non-greasy oil in a skin cream or lotion. • Prepare a nourishing face mask by mixing a quarter cup each of grapeseed oil and almond oil in one and a half cup of brown sugar. Rub it on your face and neck gently. After 15 minutes, wipe it off with a warm towel or washcloth. • Make a natural face wash for dry skin by adding two tablespoons of grapeseed oil and a tablespoon of fresh lemon juice in a cup of plain yogurt (full fat). • You can make a homemade sunscreen with grapeseed oil. Begin by mixing one-third cup of the oil, a tablespoon of emulsifying wax, and two tablespoons of zinc oxide in a double boiler. Continue stirring until the wax melts. Remove the mixture from heat and a teaspoon of vitamin E oil in it (preserves the recipe for longer). Next, take half a cup of distilled water, add two tablespoons of aloe vera gel and heat the solution slightly in a microwave or over a low flame on the stove. Pour this solution slowly in the oil and wax mixture while blending it with an electric blender. Finally, mix about 30 drops of an essential oil and ten drops of grapefruit seed extract in the recipe and store it in a clean bottle or container. Here’s a video explaining about the various benefits of grapeseed oil. • When dealing with under-eye wrinkles, you can massage the area with a combination of half an ounce of grapeseed oil, the same amount of camelina oil, ten drops each of rose and clary sage essential oil, and the contents of two vitamin E capsules. Use about a drop of this recipe around each eye and store the rest in a sterilized bottle. • Another homemade recipe for under eye area can be prepared by mixing one teaspoon of grapeseed oil, two drops each of lavender, and rosehip oil, and the contents of a vitamin E capsule. Leave this oil around your eyes overnight. • Massaging the scalp with a mixture of four tablespoons of grapeseed oil and two tablespoons of lavender or rosemary oil helps moisturize your hair. It also makes your hair grow faster. Leave this oil on your hair for half an hour before shampooing. • Heat a combination of two tablespoons each of grapeseed oil, cocoa butter, and wheat germ oil in a microwave or double boiler until it melts. Add one tablespoon each of dried chamomile flowers and rosemary leaves in the mixture and continue stirring for half an hour. Next, strain out the dried herbs and leave the recipe aside. Then, whisk an egg yolk and a tablespoon of apple cider vinegar. Finally, add the herb infused oil in this solution. Pour the mixture slowly while stirring the recipe. Add five drops of rosemary essential oil in this remedy and apply it on your hair and scalp to stimulate hair growth and cure minor scalp irritation.